There was great news last week: someone figured out how to win the lottery. Yes, yes, we know what you're thinking. But this scheme was reportedly the work of Brazilian mathematician Renato Gianella and is backed by his paper in the Biometric Brazilian Journal. So it's obviously not the usual nonsense. Except that it is: whether or not Gianella is a mathematician, his scheme is ridiculous, no better than all the other ridiculous lottery schemes. Gianella is not our concern but we'll quickly describe his scheme and explain why it is useless. Gianella focuses upon Super Sena, a Brazilian lottery similar to Tattslotto; an entry consists of choosing six numbers from 1 to 48, and the super-duper prize is won if those same six numbered balls are drawn from the barrel. Gianella notes, correctly, that any group of six numbers is equally likely to be drawn; a little arithmetic then shows that the chances of any individual entry being the winner is about 1 in 12 million. However Gianella then tries to trick the probability gods into denying this fundamental fact. Gianella assigns colours to numbers in the manner pictured above: 1 to 9 are yellow, 10 to 19 are blue and so on. 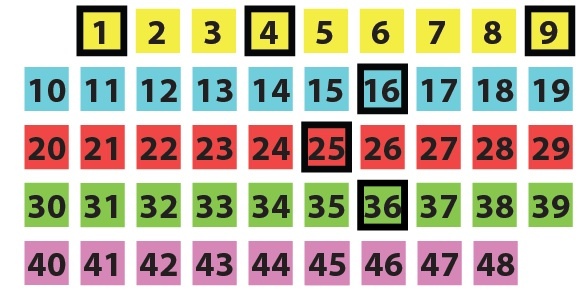 Then, any lottery entry is classified according to the colours of the numbers in the entry. For example our above entry has the colour code YYYBRG. By comparison, the entry 3, 11, 23, 31, 41, 43 would have the colour code YBRGPP. Gianella notes that some colour codes are more likely than others to appear as the winning draw. For example, there is about 1 chance in 150 that a YYYBRG group will be drawn, whereas YBRGPP has about 1 chance in 38 of being selected. Gianella claims that we can increase our chances of winning by choosing entries with more commonly occurring colour codes. Is it really all that difficult to see that this is nonsense? The reason why YBRGPP is about 4 times more likely to occur than YYYBRG is because there are 4 times as many groups of numbers with that code. But that also means YBRGPP occurring leaves a field of potential winning groups of 4 times the size. The various factors of 4 cancel themselves out and overall we're still left with that gloomy 1 in 12 million chance of winning. But who cares? Another foolish lottery scheme appears, the probability gods have another chuckle and that's about it. Well, your Maths Masters care. Gianella appears to be sincere and well-intentioned but what riles us is having news sites promote such nonsense. One may not expect great journalism from UK's Daily Mail but doesn't ninemsn have standards? And what of Yahoo7 Finance? Do their stock tips demonstrate the same level of mathematical insight? None of these reports, nor any others we've seen, raised the faintest note of scepticism. They all simply reproduced Gianella's pretty colour diagrams and regurgitated his mathematical gobbledygook. It may be impressive to refer to the "law of large numbers" but apparently none of the reporters actually know what the law means, and that the law is totally irrelevant to Gianella's scheme. Still, it may not seem like that big a deal. Some lottery fluff is definitely less of a concern than an extended campaign of climate denialist claptrap. The trouble is that it's not just lotteries: mathematics reporting is pretty much always claptrap. Your Maths Masters try to not spend all their time howling at the moon. Most of our columns are devoted to presenting pretty mathematics. But someone has to battle mathematical nonsense. And there is so, so much to battle. We've done our fair share. Along with repeated tackling of the woeful mathematics curriculum, the insidious "numeracy" virus and the ridiculous NAPLAN tests, we've devoted plenty of columns to bad reporting: plucking probabilities from the heavens to determine the chances that Jesus rose from the grave; ignoring centuries of mathematics to claim a schoolboy had bested Sir Isaac Newton; using logarithms to argue that rhinos should be doomed to extinction; applying golden ratio voodoo to sell fancy sports cars; and plenty more. But all that is just the tip of the Antarctic. Every week, every day, there is some news report that is mathematically klutzy. There are so many news stories we've wanted to tackle but for which we just haven't had the time or energy: the reporting of a tiny number of instances of cheating on NAPLAN tests as if it were a crisis; employing a specialist on abstract algebra to analyse Victoria's desalination plant; physical assaults in Australia supposedly jumping by 40% in one year; a mathematical formula for happiness; never-ending golden ratio nonsense; a university without a mathematics department ranked as top three in mathematics research; and plenty, plenty more. In brief, numerology is the life blood of reporting mathematics and statistics. We're too harsh? So "body mass index" really means something? Crime statistics faithfully imply what is reported? The considered analysis of a nation's "productivity" can be reduced to a single number? Your Maths Masters have a bridge they'd like to sell. The reality is that it would be naive to rely upon the mathematics or statistics employed in any news story. There is simply no reason to presume that the required wisdom or care has been applied. Often enough the numbers are simply there as bluff, replacing rather than promoting genuine understanding or analysis. It's just numerology. Why is the reporting of mathematics and statistics so poor? A major problem is news by press release; journalists are so overworked, so desperate to get the columns done, they have little time or incentive to question the veracity, or even the basic sense, of a news story handed to them on a platter. Unless there are blatant warning signs there is a great temptation to directly report a press release as news, without any proper checking or analysis. That is true for all reporting but it is much worse when there is a mathematical element. Even if they have the time and desire, journalists simply don't have the mathematical or statistical background to evaluate the information thrown at them. They can't detect the warning signs, making them perfect pigeons for any salesman with a mathematical barrow to push. That's where we're at. The veracity and value of almost all mathematics reporting amounts to a lottery. And there is the same likelihood of a rewarding outcome as with any other lottery.